Much of the current debate about the morality and legality of drone warfare focuses on the number of civilian casualties with little attention to its mental health, socio-economic, cultural, and political consequences. A recent study in Pakistan by the Stanford Law School and New York University (NYU) School of Law suggests that such outcomes of drone strikes need serious consideration. This article presents a learning theory analysis of the contextual trauma characteristics of drone warfare and systematic torture and points to striking commonalities between these two ostensibly different traumatic events. Substantial evidence shows that helplessness induced by unpredictable and uncontrollable stressors plays an important role in the development of traumatic stress reactions. Drone warfare shares an important characteristic with torture in involving strong elements of unpredictability and uncontrollability that are conducive to an ‘inescapable shock’ environment. Accordingly, its traumatic impact is likely to be as severe as that of torture. Furthermore, fear-induced traumatic stress reactions are likely to generalize to less frequently targeted regions, thereby creating a serious mental health problem in affected communities. In conclusion, considerations about the morality and legality of drone warfare need a broader perspective that takes into account – not just the number of civilian casualties – but also its mental health, socio-economic, cultural, and political consequences. The converging mental impacts of such adverse outcomes – essentially amounting to mass torture from a learning theory perspective – cannot be easily dismissed as “collateral damage” by any moral standard. The increasing use of drones in killing suspected militants in Pakistan, Afghanistan, Yemen, and Somalia has raised concerns about the morality and legality of drone strikes. According to official US figures supplied to DangerRoom, the national security blog at Wired.com, (1) there have been a total of 1,160 US drone strikes in Afghanistan since the beginning of 2009. Wired.com notes that the US military is now launching an average of 33 strikes per month, up from a monthly average of 24.5 last year. The Bureau of Investigative Journalism,(2) an independent journalist organization, reports that, between 2004 and 2012, the US has conducted 353 strikes in Pakistan, mostly in Federally Administered Tribal Areas (FATA). These strikes killed 2,593-3,387 and injured 1,255-1,408 people in Pakistan. Of those killed, 472-885 were civilians, including 176 children. Current debate about the legality and morality of drone strikes often focuses on the numbers of people killed and injured. It is often argued that drones strike targets with “surgical precision,” resulting in limited and therefore acceptable “collateral damage.” This argument overlooks the fact that drone strikes are likely to have far reaching mental health, socio-economic, cultural, and political consequences that are no less important than the number of civilian casualties. This point is supported by a recent study(3) by the International Human Rights and Conflict Resolution Clinic at Stanford Law School and Global Justice Clinic at NYU School of Law, which involved two investigations in Pakistan, more than 130 interviews with survivors, witnesses, and experts. Based on the information provided by this study (hereafter the Stanford and NYU study), this article presents a learning theory analysis of the psychological impact of drone strikes and reviews the similarities between drone warfare and torture trauma in their contextual characteristics, mechanisms of traumatic stress, and psychological outcomes. Such analysis requires a basic understanding of the psychological mechanisms by which traumatic events exert their psychological impact. To facilitate such understanding and also to clarify what torture means from a learning theory perspective, I will begin by briefly outlining a learning theory formulation of torture. Although views on what constitutes torture differ, there is consensus on the fact that torture involves acts that induce severe physical or mental pain or suffering. Learning theory of trauma provides useful insights into features of stressor events that cause mental pain or suffering. Since the 1960s substantial experimental work (e.g. inescapable shock experiments) with animals has shown that unpredictability and uncontrollability ofstressor events lead to anxiety and fear. [Inescapable shock experiments involved giving electric shocks to an animal placed in a box while not allowing it to stop the shocks (e.g. by pressing a lever).] Exposure to such stressors causes certain associative, motivational, and emotional deficits in animals that closely resemble the effects of traumatic stress in humans. (4)These deficits include learned helplessness – a phenomenon characterized by failure of animals initially exposed to uncontrollable shocks to later learn to escape or avoid shocks that were potentially controllable in a different situation. (5,6) Substantial evidence (7,8) from our studies of war, torture, and earthquake survivors shows that unpredictable and uncontrollable stressors have a similar impact on humans, most commonly leading to posttraumatic stress disorder (PTSD) and depression. If helplessness effects of unpredictable and uncontrollable stressors play an important role in traumatic stress, then certain contextual characteristics of torture can distinguish it from other stressful events. These include (a) exposures to often multiple, unpredictable, uncontrollable stressors that threaten physical and / or psychological well-being and (b) lack of control over the stressors leading to a state of total helplessness. This formulation implies that a particular stressor situation constitutes torture to the extent that its contextual processes maximize helplessness. It also implies that the traumatic impact of stressor events occurring in a different context (e.g. war-related violence) may not be distinguishable from that of torture if they induce similarly intense helplessness. Indeed, in our clinical practice we see many non-tortured war trauma survivors who have psychiatric disorders (e.g. PTSD, depression, and others) as severe as those in tortured individuals. For the purposes of this article, it would be helpful to clarify two misconceptions about torture. First, in most people’s mind the term torture conjures up atrocious acts of violence involving mainly physical pain. This is also reflected in the distinction between torture and other cruel, inhuman, and degrading treatment (CIDT) in international law. This distinction is not supported by empirical evidence. In two studies (9,10) we demonstrated that CIDT involving fear-inducing psychological manipulations (e.g. threats of death, threats to family, sham executions), isolation, deprivation of basic needs, exposure to extreme temperatures, and forced stress positions is (a) not distinguishable from physical torture in its immediate impact and (b) more closely associated with perceived severity of torture and more likely to lead to PTSD than physical torture. These studies also showed that the traumatic impact of torture is mediated by uncontrollability of stressor events or the extent of helplessness induced by them. Second, as the second study (10) demonstrated, the effects of stressor events in a trauma setting are not additive. Rather, they are interactive (i.e. they potentiate the effects of each other). Thus, the distress associated with each stressor event is largely determined by the interactional or contextual impact of all events. This implies that the traumatic impact of torture is not mediated solely by specific threats to safety (e.g. captors’ behaviors). The additional stressors inherent in the setting (e.g. total lack of control over the environment, deprivation of basic needs) can also significantly contribute to trauma. Thus, the term torture refers to not just specific stressor events but also the entire contextual characteristics of the setting. After this introduction we can examine how exposure to drone warfare compares with torture experience in several parameters: (a) prolonged exposure to unpredictable and uncontrollable stressor events, (b) helplessness arising from lack of control over the stressor events (e.g. fight or flight behaviors, effective avoidance or aversion of danger), (c) immediate psychological responses to helplessness (e.g. distress, anxiety, fear, terror), and (d) long-term responses to helplessness (e.g. PTSD and depression). It is clear from the Stanford and NYU study that people in FATA sustain prolonged exposure to drone strikes. Only in the last 44 months there have been 292 drone strikes, an average of 6.6 strikes per month. Drone strikes in Afghanistan have been even more frequent, amounting to an average of 33 per month. Thus, strike frequency is more than enough to induce persistent sense of threat in people. Also evident from the Stanford and NYU study findings is that people perceive drone strikes as totally unpredictable and uncontrollable. No one knows when or where the strike will happen or who will be targeted. Although only “militants” are said to be targeted, no one knows how “militants” are distinguished from civilians. “Personality” strikes appear to target allegedly high-value leaders of non-state groups, while “signature” strikes are based on a “pattern of life” analysis, targeting “groups of men” with certain “defining characteristics” that are not made public. Simply being a male of military age in an area where “militant” organizations are believed to operate appears to be sufficient to make anyone a permissible target for killing. Such targeting practices clearly introduce a strong element of unpredictability as to who would be at risk of being targeted for killing. The psychological impact of unpredictability of traumatic events is further aggravated by their uncontrollability. (4) People often utilize escape behaviors to avoid uncontrollable stressor situations. Earthquake survivors, for example, strive to avoid frightening aftershocks by simply moving to safer areas or by leaving the earthquake region altogether. Such escape or avoidance strategies do not appear to be readily available to the people of FATA. Poverty, restrictions of travel in and out of the region by the Pakistani military, mobility-limiting curfews, intense interrogation and harassment encountered at military checkpoints, and dangers posed by armed non-state actor activity appear to be some of the factors that make it difficult for many people to move to safer locations or leave the region. Another aspect of drone strikes that serves to maximize helplessness in people is the “double tap” practice.” This involves hitting a targeted site several times in relatively quick succession, thereby killing or maiming people who come to the rescue of those injured in the first strike. Such practice can be seen as serving to maximize and prolong fear in the community by increasing the unpredictability of strikes (e.g. occurrence of one strike does not mean that the threat is over). The fact that not all strikes are “double tap” also makes it difficult to predict their nature in advance. This enhances the traumatic impact of the strikes in much the same way as the practice of seasoned torturers who maximize the impact of electrical torture by giving shocks to different parts of the body in an unpredictable fashion (e.g. with variable intervals in between shocks). (7) Furthermore, the “double tap” practice is also likely to aggravate feelings of helplessness among by-standers, witnesses, rescue workers, and the community at large. Being unable to help loved ones is a major stressor that contributes to helplessness. We have seen many examples of the profound impact of helplessness in detainees and war survivors who have not been able to prevent their loved ones being tortured or killed in their presence. Similarly, in our studies of earthquake survivors, not being able to rescue loved ones from the rubble – among all disaster-related stressors – emerged as the one that evokes most intense feelings of helplessness. (8) People generally tend to help others in distress, not just out of humanitarian concerns, but also because this helps them achieve some degree of control over the stressor event, which alleviates the distress evoked by the event to a certain extent. The “double tap” practice would thus be expected to aggravate helplessness by blocking such an important coping strategy. Anticipatory fear is clearly associated with the unpredictability and uncontrollability of drone strikes. Such anticipatory fear is likely to be very intense, as evidence (9) shows that anticipation of a life-threatening event is among the most fear-evoking stressors in a war setting. Similarly, some survivors of torture report that anticipation of torture is worse than experiencing the event itself. (7) Evidence (8) also shows that prolonged exposure to unpredictable and uncontrollable life-threatening events leads to intense fears in most people. Furthermore, such events also lead to strong conditioned fears that are beyond cognitive control and resistant to extinction. (4) This means that drone warfare is likely to have a cumulative impact on a community (i.e. increasing the prevalence of traumatized individuals with each strike) that is likely to last well beyond their cessation. Fear of drones is likely to generalize to less frequently targeted regions. Learning of fear does not even require a personal experience of a life-threatening event. Humans are susceptible to acquiring fear vicariously through media (4) or simply by observing or hearing about others’ trauma experience or fear responses. (8) In addition, even after a single traumatic event people often overestimate the probability of re-living the same event – a cognitive process that maintains or even augments fear. Thus, just a few drone strikes in a particular region would be more than sufficient in spreading as much fear in that region as in more frequently targeted regions. Fear often generalizes to all aspects of life leading to substantial functional impairment in important life areas, most often caused by extensive avoidance behaviors. (8)The Stanford and NYU study illustrates how avoidance affects people’s lives. People do not send their children to school and many children do not want to go to school. Many have stopped going to funerals, mosques, house visits, shopping places, and other social gatherings. People do not even sit outdoors in groups, because of past strikes targeting groupings of people. They have great difficulty going about their daily business and community activities. Trade has been adversely affected, because people are afraid of going to bazaars. Fear has also had an eroding effect on the Jirga system – a vitally important community-based conflict-resolution process that enables people to resolve their conflicts and problems by coming together in large groups. We have observed similar generalized fear and avoidance responses in torture survivors. While such fear and avoidance can be realistic to some extent, they can also be associated with essentially harmless activities, situations or even objects. For example, a torture survivor who was forced to sign a blank sheet of paper for confession of a crime she had not committed subsequently stopped wearing white socks because their color reminded her of the sheet of paper she had signed. Many torture survivors have fear of a wide range of situations or activities that evoke memories of torture or evoke fears of re-living the same events. Such extensive avoidance (which can make some people totally housebound) often leads to significant impairment in social and work functioning. When debilitating fear spreads to large sectors of the population, it may indeed have serious social and economic consequences. The social environment of fear and mistrust described above also characterizes societies that face threats of violence, detention, and torture by a politically repressive regime. Such regimes often use informants to identify, locate, and capture dissidents or political activists, thereby spreading mistrust and fear among people, including non-activist civilians. Accordingly, many people resort to elaborate measures of safety, not always realistic but nevertheless serve to reduce anxiety induced by an unpredictable and uncontrollable stressor situation. In FATA mistrust of “suspicious” others may serve a similar psychological function by making people think that if they can identify people likely to plant “chips” (or the location of planted “chips”) they can take action to avoid being targeted by drones. Such desperate attempts to avert danger essentially reflect the extent of helplessness induced by drones. Such helplessness is also likely to be compounded by the detrimental impact of mistrust on social support networks in the community. Regardless of whether the fear of chips is realistic or not, this social phenomenon illustrates how drone policy can create a contextually traumatic social environment. The Stanford and NYU study provides accounts of traumatic stress reactions from survivors as well as from Pakistani mental health professionals. These include anticipatory anxiety or fear, nightmares, intrusive thoughts, hypervigilance, startle reactions to loud noises, outbursts of anger, irritability, sleep disturbances, loss of appetite, “hysterical reactions,” psychosomatic symptoms, such as aches and pains in the body, headaches, respiratory distress, indigestion, and behavioral disturbances in the children. Interviewed Pakistani psychiatrists reported that these problems are prevalent in the region because of widespread belief that “they could be attacked at any time.” These are clearly manifestations of PTSD and depression. The evidence provided by the Stanford and NYU study supports the point that trauma of drone warfare, as conducted in FATA, is similar to an experience of torture in involving five distinct features: (a) prolonged exposure to (b) unpredictable and (c) uncontrollable stressors in an (d) inescapable environment leading to (e) intense fear-induced helplessness responses. Although other stressful war events (e.g. aerial bombardment) may have some of these features, few have all of them in the same pronounced fashion as drone warfare. Despite their different contexts, the overlap between these features of drone warfare and torture is so striking that it deserves attention from both moral and legal perspectives. Because of their intense helplessness-inducing effects, drone strikes are likely to lead to extreme fear and related traumatic stress reactions in people. Such traumatic effects are likely to extend beyond those who directly suffer or witness the devastating impact of strikes to many others in targeted regions. There is evidence (11) to show that perceived threat to safety is a more important predictor of PTSD and depression than direct exposure to traumatic events, including enemy fire and casualties. This implies that, from a public health perspective, threat appraisal is a more important risk factor for traumatic stress than actual exposure to a devastating event. The socio-economic, cultural, and political consequences of drone strikes directly resulting from pervasive fear also attest to the severity of fear induced by drones. Such secondary impacts of drones are most likely to have converging adverse impacts on mental health through maximizing helplessness. Among the many likely mental health consequences of such trauma, PTSD and depression alone often constitute a debilitating condition that can last a lifetime. Having PTSD can mean life-long condemnation to daily re-experiencing of the terror of drones through intrusive thoughts, reminders, flashbacks, or nightmares. Such mass trauma is also known to be associated with increased rates of mortality and suicide in the population (a long-term consequence of drone warfare that also needs to be taken into account in counting the number of casualties). In the absence of epidemiological data, nothing conclusive can be said about the prevalence of mental health problems caused by drone strikes in FATA. Nevertheless, abundant evidence from studies of war survivors suggests that they are likely to pose a serious mental health hazard in targeted regions, affecting far more people than those in the immediate vicinity of the strikes. In a meta-analysis (12) of 181 surveys involving 81,866 refugees and other war-affected people from 40 countries, the prevalence rates of PTSD and depression were 30.6% and 30.8%, respectively. These figures are likely to be higher after potentially more helplessness-inducing mass traumas. Indeed, in a study (11) we found that 56% tortured war survivors had PTSD about seven years after trauma. Thus, it would not be unrealistic to expect similarly high rates of PTSD among the people in FATA, particularly among those living in and around the “epicenter” of drone strikes. The Stanford and NYU study concludes that drone strikes in FATA may contravene international law, including Article 7 (“No one shall be subjected to torture or to cruel, inhuman or degrading treatment or punishment.”) of the International Covenant on Civil and Political Rights. This implies that drone strikes may constitute at least cruel, inhuman, and degrading treatment (CIDT). As noted earlier, our studies (9,10) show that CIDT involving fear-inducing acts is not only indistinguishable from physical torture in its immediate psychological impact but also more likely to lead to PTSD than physical torture. If international law prohibits torture because it induces “severe physical or mental pain or suffering,” then the mental impact of drone strikes needs to be given equal weight in judging the morality or legality of such warfare. Indeed, inflicting severe and prolonged mental suffering on people essentially trapped in an ‘inescapable shock’ situation is no less morally abhorrent than torture and, at least from a behavioral science perspective, may well amount to mass torture. Considering that masses of people are likely to be affected by severe trauma, such consequences of drone warfare cannot be easily dismissed as “collateral” damage by any moral standard. Thus, it is most important that the human rights community, as well as the media, adopt a broader perspective on this issue, taking into account not just civilian casualties or injuries, but also the serious public health consequences of drone warfare. 1 Shachtman N. Military stats reveal epicenter of U.S. drone war. November 9, 2012. http://www.wired.com/dangerroom/2012/11/drones-afghan-air-war/ Last accessed on November, 14, 2012. 2 The Bureau of Investigative Journalism. Covert drone war. http://www.thebureauinvestigates.com/category/projects/drones/ (accessed December 5, 2012). 3 International Human Rights and Conflict Resolution Clinic at Stanford Law School and Global Justice Clinic at NYU School of Law. Living Under Drones: Death, Injury, and Trauma to Civilians from US Drone Practices in Pakistan, 2012. http://livingunderdrones.org/ (accessed December 5, 2012). 4 Mineka S & Zinbarg R (2006) A contemporary learning theory perspective on the etiology of anxiety disorders – It’s not what you thought it was. American Psychologist, 61, 10–26. 5 Seligman MEP & Maier SF (1967) Failure to escape traumatic shock. Journal of Experimental Psychology: Animal Behavior Processes, 74, 1–9. 6 Overmier JB & Seligman MEP (1967) Effects of inescapable shock upon subsequent escape and avoidance responding. Journal of Comparative and Physiological Psychology, 63, 28–33. 7 Başoğlu M & Mineka S (1992) The role of uncontrollable and unpredictable stress in posttraumatic stress responses in torture survivors. In Torture and its Consequences: Current Treatment Approaches, ed. M. Başoğlu. Cambridge: Cambridge University Press, 182–225. 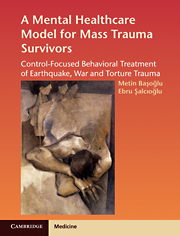 8 Başoğlu M & Şalcıoğlu E (2011) A mental health care model for mass trauma survivors: Control-focused behavioral treatment of earthquake, war, and torture trauma. Cambridge University Press. 9 Başoğlu M et al. (2007) Torture versus other cruel, inhuman and degrading treatment: Is the distinction real or apparent? Archives of General Psychiatry, 64, 277–85. 10 Başoğlu M (2009) A multivariate contextual analysis of torture and cruel, inhuman, and degrading treatments: Implications for an evidence-based definition of torture. American Journal of Orthopsychiatry, 79,2,135-145. 11 Başoğlu M et al. (2005) Psychiatric and cognitive effects of war in former Yugoslavia – Association of lack of redress for trauma and posttraumatic stress reactions. Journal of American Medical Association, 294,580-590. 12 Steel Z et al. (2009) Association of torture and other potentially traumatic events with mental health outcomes among populations exposed to mass conflict and displacement: A systematic review and meta-analysis. Journal of the American Medical Association, 302(5), 537-549.